BlackBerry still dominating US smartphone market | BlackBerry Blast! With all the hype over Android, and the continued strong marketing of Apple's iPhone, RIM's BlackBerry still dominates the US smartphone market. 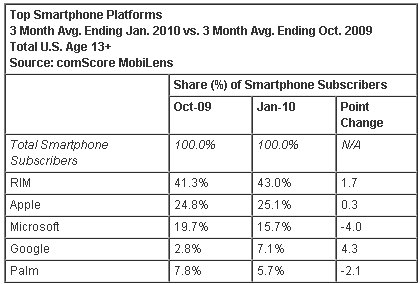 comScore has released their latest survey results and as you can see, BlackBerry still dominates. "42.7 million people in the U.S. owned smartphones in an average month during the November to January period, up 18 percent from the August through October period. RIM was the leading mobile smartphone platform in the U.S. with 43.0 percent share of U.S. smartphone subscribers, rising 1.7 percentage points versus three months earlier. Apple ranked second with 25.1 percent share (up 0.3 percentage points), followed by Microsoft at 15.7 percent, Google at 7.1 percent (up 4.3 percentage points), and Palm at 5.7 percent. Google�s Android platform continues to see rapid gains in market share."